also, make sure to check out other works by the artist here. “The Twilight of Returning” is a sound-art performance related to the deep senses , to the perception of memory and the way how an object of remembrance returns in less of its original form. The sounds establish meeting points between the contexta and the listener, each sound bears unique perceptions and aims to trasmit an abstract sense of affiliation to the self. Perceiveing memory, not as a meditation on the object of remembrance but as a meditation on memory itself and how memory can never reappear detachedly from the flow of thoughts/contextx/sensations that a person has during his life. Every time a memory reappears it exists as a context in progressive evolution. To remember means to continually rediscover yourself in the present state of being. Twilight: Aesthetic/conceptual conjunction between the element of fading (of a memory) and the romantic element of the perception of the fading itself. The performance takes place for a period of about 45-50 minutes. The design of the sketch of the musical bases and modulations/stratificationa of the sounds will be prepared in advance and will then be completed during the performance through the laptops, the softwares designed by the artist and the electronic devices. The soundworks have a minimalist approach and the performance will also include an associative visual element with a video composed of slowly flowing blurred shapes to provide a hypnotic character to the continuity of perception.. The visual element is not meant to be directly related to the music, but have an additional effect to the musical concepts by creating a separate presentation in two different planes, like looking at an object directly in front of our vision and one in the tail of our vision at the same moment. Writer/sound artist from Tirana focused on “Musique Concrete”, an abstract musical form in the field of experimental electronic music. Ilir compositions have been presented/performed in artistic environments and installations in Tirana while his first album was released in March 2014 by the Italian label Manyfeetunder with wider listening in other countries like Italy , Germany , France, England. Several other works have been published published as singles online at the Bandcamp page of the artist. The sound compositions contain recorded daily sounds of the city life which are then extremely modified/reshaped until they loose their original form and context merging with instrumental and electronic sounds to form new layers of organic nature. Among the composers who have influenced Ilir conceptually/musically are: Luigi Russolo, Pierre Schaeffer, Bernard Parmegiani, Luc Ferrari, Francis Dhomont, Eliane Radigue, John Cage, Giacinto Scelsi , Morton Feldman, Karlheinz Stockhausen, Autechre, Akira Rabelais, Atau Tanaka, Fabio Orsi, Ryoji Ikeda, etc. Ilir Lluka has composed music for installations performed in Tirana and short film be commissioned by the Academy of Arts presented in February 2014 at the Black Box Theater at the Academy of Arts. In March 2013 he has been part of a worldwide radiophonic/web event alongside-known figures in the world of contemporary music like Pauline Oliveros , Felicia Atkinson , Rhys Chatham , Eyvind Kang , André Gonçalves and many others representing Albania as an active point in the sound-art scene . His latest live performance "Intimate Sound Perceptions" was held on February 2014 in the premises of the National History Museum, Tirana. The artist’s forthcoming album, a sound poetry collaboration with the poet Jonida Prifti, will be issued on June 2014 by the Italian label Ozky E-Sound. Since 2011 he is a member of “A Material, A Sound, A Shape”, a community consisting of many known artists in the field of experimental music, where are held promotions and collaborations beyond the divisionas between the national borders of the members. Ilir has been invited to participate in the edition of 2015 of Avantgarde Festival in Schiphorst, Germany. 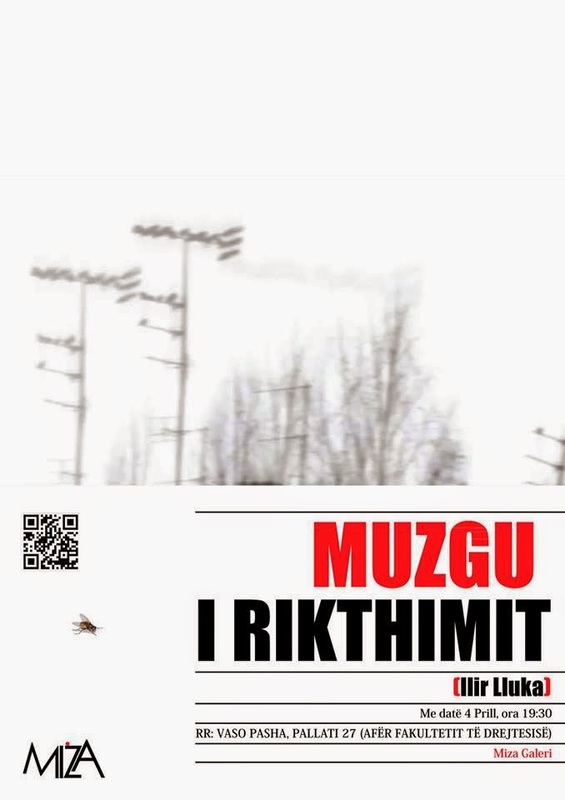 “Muzgu I Rikthimit” nga Ilir Lluka from MIZA on Vimeo. “Muzgu I Rikthimit” eshte nje performance zanore e lidhur me thellesine e shqisave, perceptimin ndaj memories dhe menyres sesi cdo objekt I kujtuar rikthehet duke sjelle gjithmone e me pak nga forma e tij origjinale. Tingujt percaktojne pika takimi mes kontekstit dhe degjuesit, secila pike mbart nje perceptim unik dhe synon tejcimin e nje ndjesie abstrakte perkatesie te gjithsecilit ndaj vete vetes se tij. Te perceptosh nje kujtim jo si meditim rreth objektit te memories por si meditim rreth vetvetes dhe sesi nje kujtim i caktuar nuk mund te rishfaqet dot kurre ne forme te ftohte i vecuar nga rrjedha e mendimeve/perceptimeve te vazhdueshme qe cdokush ka gjate jetes se vet. Cdo here qe nje kujtim rishfaqet mbart nje kontekst ne evolim. Te kujtosh, ne nje sens egoist te eperm do te thote te rizbulosh veten ne menyre te vazhdueshme. Muzgu: Nderlidhje estetike/konceptuale midis elementit te venitjes (se nje kujtimi) dhe elementit romantik te perceptimit te venitjes. Performanca zhvillohet pergjate nje harku kohor prej rreth 45-50 minutash. Nje skice e bazave muzikore dhe modifikimeve/shtresezimeve te tingujve do jete e dizenjuar dhe parapergatitur dhe me pas do te plotesohet gjate performances nepermjet laptopit, software-ve te dizenjuar prej artistit dhe aparaturave elektronike. Punimet muzikore do kene natyre minimaliste dhe performanca do perfshije edhe nje element vizual shoqerues te po kesaj natyre te perbere nga video me forma me rrjedhe te ngadalte per ti dhene karakter hipnotik vazhdimesise se perceptimit. Elementi vizual nuk ka si qellim te kete lidhje te drejtperdrejte me muziken por te kete efekt plotesues anesor te koncepteve muzikore duke krijuar nje paraqitje te ndare ne dy plane te ndryshme, njelloj sic eshte shikimi I nje objekti ne menyre te drejtperdrejte dhe shikimi I objekteve ne rrafshin anesor me bisht te syrit ne te njejtin moment. Shkrimtar/sound-artist nga Tirana i fokusuar ne “Musique Concrète”, nje forme abstrakte muzikore ne fushen e muzikes elektronike/eksperimentale. Kompozimet e Ilirit jane paraqitur/performuar ne ambiente artistike dhe instalative ne Tirane nderkohe qe album I tij I pare eshte leshuar ne mars 2014 prej shtepise diskografike italiane Manyfeetunder Label me degjim me te gjere ne vende te tjera si Itali, Gjermani, France, Angli. Njekohesisht disa punime te tjera jane publikuar si singles ne internet ne faqen e Bandcamp te Ilirit. Krijimet permbajne ne themel te tyre tinguj te perditshem te jetes se qytetit te cilat trasformohen ne mase ekstreme deri sa humbin formen dhe kontekstin e tyre origjinal dhe shkrihen me tinguj instrumentale dhe ato elektronike per te formuar shtresa te reja me natyre organike. Nder kompozitoret qe kane influencuar tek Iliri nga ana konceptuale/muzikore jane: Luigi Russolo, Pierre Schaeffer, Bernard Parmegiani, Luc Ferrari, Francis Dhomont, Eliane Radigue, John Cage, Giacinto Scelsi, Morton Feldman, Karlheinz Stockhausen, Autechre, Akira Rabelais, Atau Tanaka, Fabio Orsi, Ryoji Ikeda etj. Ilir Lluka ka kompozuar muzike per instalacione te kryera ne Tirane dhe per kortometrazh te komisionuar nga Akademia e Arteve i prezantuar ne shkurt 2014 ne sallen Black Box te Akademise se Arteve. Ne mars 2013 ka qene pjesemarres ne nje event mbareboteror radiofonik/web perkrah emrash te njohur te botes se muzikes kontemporane si Pauline Oliveros, Felicia Atkinson, Rhys Catham, Eyvind Kang, André Gonçalves dhe shume te tjere duke perfaqesuar Shqiperine si nje pike aktive ne skenen e sound-artit. Performanca e tij e fundit live “Intimate Sound Perceptions” u mbajt ne shkurt 2014 ne ambientet e Muzeut Historik Kombetar, Tirane. Albumi i ardhshem i Ilirit, nje bashkepunim ne sound/poetry me poeten Jonida Prifti, do leshohet ne qershor 2014 prej labelit italian Ozky E-Sound. Qe prej vitit 2011eshte pjese e “A Material, A Sound, A Shape”, nje komunitet i perbere nga artiste te njohur ne fushen nderkombetare te muzikes eksperimentale, ku kryhen promovime dhe bashkepunime pertej ndarjeve te kufijve shteterore midis pjesetareve. Iliri eshte ftuar te marre pjese ne edicionin e 2015 te Avantgarde Festival ne Schiphorst, Gjermani. LIVE “The Twilight of Returning“ by Ilir Lluka from MIZA on Vimeo.